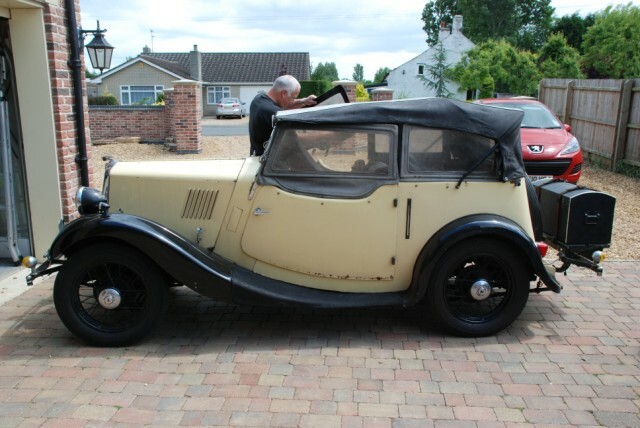 The 'Yellow Peril' is a 1936 Morris Eight Tourer, owned by Chris' parents, Marion Waller, and the late Wally Waller, (Morris Register members 6364/1). After sitting in a garage for ten years, and only coming out for the odd show, Chris' Mum sold us the car, as she wanted to make sure the car received the T.L.C she desperately needed. We too have now joined the Morris Register, (12445/6), and hope we can gain some advice along the way during the restoration, as well as make new friends of a like mind. Work started on 'The Yellow Peril' on 20/6/2010. We decided to simply sort out the interior to start with, so we could go to any remaining events of the year. This involved repairing the rotten floorboards and the front and rear seats. To see details of the work carried out, click on the headings below. The first thing we found was that the floorboards and rear seat were rotten with woodworm!!! (Didn't take too much looking for). Engine Rebuild - Coming Soon!!! On the way back from a show, the engine died, so a rebuild was required!!! Next the front seats needed to be repaired so your bum wasn't touching the floorboards whilst driving. Various electrical jobs carried out. Both doors had some rust, so it had to go. A list of the parts and the suppliers used during the restoration. Some useful links to other Morris Eight web sites. Links to video footage of the Manneken Pis of 1987. The original was donated to me by Morris Register member Nev Morley, and the original photographer Terry Cook. More details will be added as and when we do the work.